For Tyler Gardner, part of its appeal is that charcoal toothpaste is a drama queen among medicine cabinet bores. Gardner, an IT specialist who lives in Bowling Green, Kentucky, bought some after seeing Facebook ads for charcoal toothpaste and watching YouTubers spread the jet-black goop or powder on their teeth, brush it until their mouth looks thoroughly infested by an onyx slime, and rinse to reveal a brighter, somehow-whiter smile. Gardner said he imagined it might be abrasive for people with sensitive teeth, but to him, it works and feels like any other toothpaste — except that is seems to do a better job of whitening. Charcoal toothpastes and powders promise to whiten and clean teeth naturally — but dentists and researchers worry there’s not enough testing of the products’ safety, and that they could do more harm than good to users’ oral health. Limited studies even suggest the charcoal’s size and composition could actually roughen tooth enamel, which protects teeth from decay and cannot regenerate. And then there’s charcoal toothpaste (to be clear: not the same charcoal as what you’d throw on the grill). Activated charcoal is made by burning certain materials — coconut shells, bones, sugar, coal, peat, wood or petroleum — then ‘activating’ the charcoal by heating it in 1,100- to 1,600-degree-Fahrenheit steam, air or carbon dioxide. The product is then washed and dried to create an incredibly porous and fine-grained product, according to the World Health Organization. Activated charcoal does have its evidence-backed medicinal uses (in 2017, the WHO included activated charcoal on its list of essential medicines that compiles the most effective, safe and economical medicines for priority conditions). Doctors use activated charcoal in emergencies to treat specific kinds of poisoning to help prevent the stomach from absorbing poison into the body, the Mayo Clinic says. However, the Clinic warns, it should be taken only under the advice of a poison control center, doctor or emergency room staff. In fact, powdered charcoal, soot or coal ash has been used for hundreds of years — to clean teeth using fingers, cloth or chewing sticks — in countries including Bangladesh, the United Kingdom, Nigeria, Italy and Malaysia. The first records of charcoal for oral hygiene date back to ancient Greece, when Hippocrates made this recommendation for black gums and fetid breath: burn the head of a hare and three mice, grind with a mortar and pestle, and rub the charcoal into teeth and inside of the mouth. The Romans concocted animal bone ash mouthwashes and tooth powders made from burnt goat hooves, according to infectious disease historian Bill Newsom. Later, 19th century English homemakers used the charcoal in their own toothpaste recipes, Colgate says. In the 1930s, Kramer’s Original Charcoal Dental Cream, contained burned willow twig charcoal. A decade later, radio ads for Peter Paul’s Charcoal Gum claimed “when you chew this gum, see how it makes your mouth fresher, your breath sweeter, and how it helps remove tobacco and other stains from the teeth,” and called activated charcoal “an ingredient almost magical in the way it absorbs impurities.” Safety concerns led the Council on Dental Therapeutics, a program sponsored by the American Dental Association to assess dental products, deemed both products unacceptable in 1932 and 1946, respectively. Today, charcoal has risen from the ashes. In recent years, New Yorkers have sampled and savored black charcoal ice cream, lattes, cocktails, burger buns and bagels — even though New York City restaurants are technically not allowed to prepare and sell food with activated charcoal without the Food and Drug Administration’s approval, according to New York City health department spokesman Michael Lanza. Activated charcoal is a popular ingredient in beauty products such as cleansers, face masks and shampoos, and sold as a stand-alone supplement in drug stores nationwide. Bougie water bottles boast charcoal filters and trendy beverage company Dirty Lemon offers a $65 six-pack of its 16-oz charcoal “elixir” that improves digestion and stimulates liver function. And then there’s activated charcoal for teeth. Web searches for charcoal toothpastes were practically nonexistent until early 2017, when interest surged, according to Google Trends. Today, a search for charcoal toothpaste on Amazon directs you to hundreds of products. The brand Hello charges $6 for what it says is the top-selling charcoal toothpaste in the U.S., and another $7 for its activated charcoal mouthwash. You can even purchase a Colgate charcoal toothpaste for $5.70 a tube. Lush, the popular vegan handmade cosmetic company, sells small charcoal tablets — which users crunch between their teeth and scrub with a toothbrush — for about $11 per 1.7 oz bottle. Ads for Dental Expert’s charcoal toothpaste leave purchasers confident they are purchasing a dental panacea. They claim the toothpaste will make your teeth sparkle, boost your confidence with day-long fresh breath, relieve bleeding gums and defeat plaque and oral ulcers. Some, including John Brooks, a dentist at University of Maryland in Baltimore, are skeptical of claims by companies selling charcoal toothpastes. For a 2017 study, he took a hard look at the trend and reviewed claims made by charcoal-based toothpastes. Brooks found 48 out of 50 brands included in the study promised to whiten teeth, and almost all promoted themselves as organic, eco-friendly, natural, herbal and pure. About half claimed to “detoxify” or advertised themselves as antibacterial or antiseptic. A third of the products Brooks reviewed said they could remineralize, strengthen or fortify teeth — even though just four of them contained fluoride, a key toothpaste ingredient that strengthens teeth and helps prevent cavities. To take a survey of the scientific evidence for charcoal tooth products’ effectiveness and safety, Brooks then turned to past research and looked for rigorous studies. He didn’t find much. 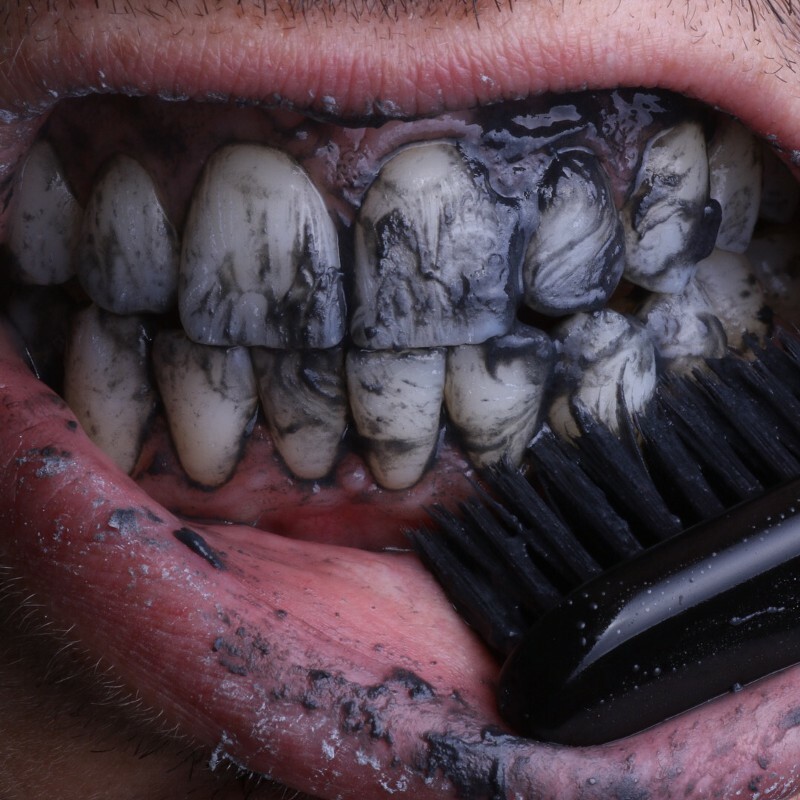 He found only 13 studies looking at brushing teeth with raw charcoal or soot. None were scientifically rigorous, he said, and results across the board were mixed. Two suggested a reduction in cavities while three reported increased cavities, enamel abrasion or other negative impacts. One study indicated brushing with raw charcoal had no adverse effects. The other seven documented the use of charcoal for oral hygiene, and didn’t examine its safety, bioactivity or toxicity. Taken together, Brooks said, there’s simply not enough evidence to back the promises made for using charcoal for oral hygiene. In addition, Brooks said, there’s no proof of its safety — which is why he warns dentists to tell their patients to exercise caution with charcoal tooth products. Morihata, a U.S. wholesaler of Japanese design products including a line of Binchotan charcoal-infused towels, face scrubs and toothbrushes, is careful not to overblow their sales pitch, said marketing director Sam Gean. Just because every major beauty brand is hopping on the charcoal bandwagon, he said, that doesn’t mean it’s a perfect ingredient. The U.S. Food and Drug Administration regulates both cosmetics — products that make us smell and look better — and therapeutic drugs, which contain active, health-improving ingredients. Take for example, petroleum jelly. If it’s sold as a makeup for eyelids, the FDA considers it a cosmetic. If it’s labeled for chapped lips, it’s an over-the-counter drug to the FDA. Both categories come with their own oversight and regulations, and in cases of misleading advertisement or reports of people getting sick, the FDA can send warning letters to companies or ask for a recall. Charcoal toothpaste, despite its jet black color, is a gray area for the FDA. The administration has not, to date, taken public action on activated charcoal tooth products. The assumption is everyone is in compliance, a spokeswoman said. Since Brooks’ 2017 study, one scientific foray into charcoal toothpaste concluded tooth surfaces were significantly rougher after using charcoal toothpaste. For the experiment, dental researchers from Universitas Indonesia in Jakarta compared the results of brushing with either distilled water, regular toothpaste or a charcoal toothpaste. They used a machine to brush 30 specimens for four minutes and 30 seconds (equivalent to one month of use) and 14 minutes (or a month’s worth of brushing). They then measured the surface roughness and found the roughness of tooth enamel was significantly different after just a month of brushing with toothpaste containing charcoal. Brooklyn dentist Dr. Khabensky pointed to the results of that experiment as a reason why he’s worried about the abrasiveness of charcoal toothpastes. That, and his personal experience with the product. When patient after patient asked about Khabensky about the dramatic, trendy toothpaste, he decided to try it firsthand. He bought the highest-rated charcoal toothpaste he could find on Amazon and started brushing. People think white teeth are healthy teeth — but that’s not true, and worn-down enamel can actually lead to softer and yellower or darker teeth, said Rodriguez, who is also a spokesman for the American Dental Association, a 250-year-old professional organization. That can defeat the purpose of whitening in the first place, he added. Sure, activated charcoal is good at detoxifying and cleaning, he said, but that doesn’t mean people should polish the inside of their mouths with it. “Kitty litter is great, but I wouldn’t go ahead and brush my teeth with it,” Rodriguez said. Charcoal may be able to scrub off a tooth’s surface stains, but it can’t reach internal staining caused by coffee, wine, tea, juices and smoking; only peroxides can get to those, Rodriguez said. And the potential dangers outweigh the temporary whitening, according to him. Carbon particles can collect around fillings and get into cracks of damaged teeth, dyeing those areas darker. And if they wear down enamel — which cannot heal or grow back — they can actually reveal the tooth’s underlayer, dentin, which is soft and yellow. Most companies do not reveal whether their products are too abrasive for teeth — even though almost a third of the products reviewed by Brooks claimed to be gentle to the enamel, he said. Across the 50 brands he examined, only one mentioned its abrasive score — the relative dentin abrasion value, a standard measure used to determine whether a product could injure the tooth’s outer layer. To be fair, a handful of companies test for and publicly provide the RDA values of their products. The Natural Dentist Charcoal Whitening Toothpaste reports an average RDA of 76, a value comparable to traditional toothpastes sold by Colgate and Sensodyne. Lush’s charcoal tooth tablets land at 96. Other companies insist their products are safe but declined to share details of their testing or its results for this story. Craig Dubitsky, founder of Hello, another charcoal toothpaste purveyor, wrote that the company makes it products in FDA-approved facilities and tests them in independent labs for RDA and fluoride uptake, but did not provide specific values for the results of those tests. Brooks said he suspects most charcoal toothpaste manufacturers do not publicize their abrasion scores because they may not have conducted those tests — and they’re not required to. Regardless of hype and glowing Amazon reviews, professional dentists suggest at-home strips or professional treatments for whitening as well as eating healthily, getting regular dental cleanings and avoiding tobacco products for better overall oral health. The ADA also gives its seal of approval to safe, effective products whose vendors provide evidence from lab and clinical studies. It has not yet approved a charcoal product.